Because of his unique voice and extroardinary talent, Chris Vaughn was not forgotten by anyone who heard him sing. Landon Taylor who is a long-time friend of Chris', was instrumental in getting Chris an audition as bass player for Clay Walker. For three years he played bass guitar and sang back-up for Clay and on many occasions actually opened the show for him.For a country boy, touring and traveling over the entire United States and Canada was a dream come true. He then played bass and sang back-up for Wade Hayes for a couple of years. Chris has played most every major venue in the U.S. and Canada. While playing with Clay Walker he appeared on Countdown at the Neon Armadillo, the Tonight Show with Jay Leno, Crook and Chase, Music City Tonight, Nashville Now, The Ryman and The Grand Ole Opry. He has also appeared in Clay Walker's Video "If I Could Make A Living Out of Loving You". In the fall of 2003, Chris and his wonderfully supportive wife, Melissa, managed a plan for him to devote his time to completing the album he so desperately wanted to record. Because of the sacrifices they were willing to make, he completed the album in 2004. All the songs(except In Memory of a Memory by Johnny Paycheck) are original and are performed on the CD by Chris with his sister Charlie singing harmony. The arrangements are also by Chris. These songs are "real country" the way country songs are supposed to sound. * Your song 'The Wind' has just been added to Mighty Fortress (Franck Doristil's ) station! * Your song 'Backward' has just been added to Songpluggers country pop favorites station! * Your song 'Backward' has just been added to Big Dog Radio station! * Your song 'Picture in my Mind' has just been added to An Emotional Response station! * Your song 'Picture in my Mind' has just been added to My Old Kentucky Home station! * Your song 'In Memory of a Memory ' has just been added to Slick Country station! * Your song 'Hold on to Her' has just been added to Slick Country station! * Your song 'I Still Love You' has just been added to Slick Country station! * Your song 'Material Cowgirl' has just been added to Chain Ball Country station! * Your song 'Material Cowgirl' has just been added to Prime 50 station! * Your song 'Backward' has just been added to Heartland station! * Your song 'Backward' has just been added to Nashville Indie Stars station! * Your song 'The Wind' has just been added to Nashville Indie Stars station! * Your song 'I Still Love You' has just been added to The Stage station! * Your song 'Out of Your Mind' has just been added to The Stage station! * Your song 'Backward' has just been added to Mighty Fortress (Franck Doristil's ) station! * Your song 'Out of Your Mind' has just been added to Mighty Fortress (Franck Doristil's ) station! * Your song 'In Memory of a Memory ' has just been added to Mighty Fortress (Franck Doristil's ) station! * Your song 'Material Cowgirl' has just been added to COUNTRY REBELS station! * Your song 'Out of Your Mind' has just been added to COUNTRY REBELS station! * Your song 'Backward' has just been added to The Country Rose Show station! * Your song 'Backward' has just been added to Micks Picks station! * Your song 'Out of Your Mind' has just been added to Micks Picks station! * Your song 'In Memory of a Memory ' has just been added to Micks Picks station! * Your song 'In Memory of a Memory' has just been added to Cashbox Country Picks station! * Your song 'Backward' has just been added to DAVE RADIO station! * Your song 'In Memory of a Memory' has just been added to DAVE RADIO station! * Your song 'In Memory of a Memory' has just been added to Yrral Malliks Country station! * Your song 'Backward' has just been added to Eagle Dreams station! * Your song 'Out of Your Mind' has just been added to Eagle Dreams station! * Your song 'In Memory of a Memory' has just been added to Eagle Dreams station! * Your song 'In Memory of a Memory' has just been added to WPNX station! * Your song 'In Memory of a Memory' has just been added to Shake Rag Music Radio station! * Your song 'Backward' has just been added to WPNX station! * Your song 'Backward' has just been added to Chain Ball Country station! * Your song 'Backward' has just been added to Prime 50 station! * Your song 'Backward' has just been added to IAC BEST COUNTRY station! * Your song 'Backward' has just been added to KczxOnline station! * Your song 'Backward' has just been added to Mighty Fortress Radio (F.Doristil's ) station! * Your song 'Backward' has just been added to RCEI Gospel Hits station! * Your song 'In Memory of a Memory' has just been added to RCEI Gospel Hits station! * Your song 'Why Me' has just been added to Get Down Music Nashville station! Peggy Mercer I love your song, WHY ME...will promote all I can! Great job! I hope to see you sometime and work with you on one! IAC Your song 'Backward' has just been added to XNWY Kickinghorse Country Radio station! What a year it was for Alabama singer, songwriter Chris Vaughn. 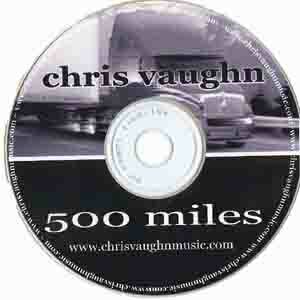 His debut album "Chris Vaughn 1" racked up six # 1 songs on five different independant charts. He also scored a # 4 on iSounds.com in all genres.Chris' remake of "In Memory of a Memory" (Johnny Paycheck classic) climbed to # 18 on Soundclick in the country cover tune category, and "Out of Your Mind" shot to # 3 at Music Forte. After 20 years in the music business, Chris recieved his first record deal in 2006 with independant record label Retrac Records. His new album is due out later this year. Chris feels very fortunate to have such a great new label who believes in his vision. Chris' single " I still love you" recieved TV airplay on the PAX network in Nashville when it was featured on the Record Row Review TV show. He also appears on the TripleStrand Productions compilation album, "Country Legends in the Making", where he appears alongside country star Ed Bruce and his favorite new independant artist Kristi Warner. Chris had never entered any type of songwriting contest, but reluctantly gave in to his wife and entered the I M A songwriting contest. The single "Backward" placed in the top five in this international songwriting competition. Chris wishes to congratulate Shawn Patrick McGraw, the winner of the I M A's for his song "Fiona". 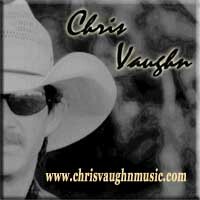 2006 was also a great year for Chris Vaughn and "Real Country's" live performances. They not only hit the honky tonks and bars, but he and his band "Real Country" helped raise money for local schools and local non-profit organizations like EASI ( Equines Assisting Special Individuals). Chris recieved airplay on countless radio and internet radio stations around the world. DJs are adding his music to their playlist daily. In summary, his "record" speaks for it's self. For an independant artist who, as Chip Winthrow of Muse's Muse puts it,"Chris merits a shot at big-time success. He’s his own man, in charge of his own sound and image", You can bet we will be hearing a lot more from this very talented artist in 2007.